Astronaut James Irwin, on the Apollo 15 mission, loads the LRV. 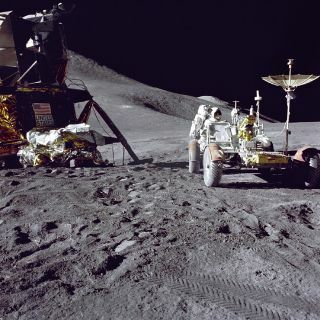 In this historical photo from the U.S. space agency, Apollo 15 Lunar Module pilot James B. Irwin loads-up the "Rover", Lunar Roving Vehicle (LRV) with tools and equipment in preparation for the first lunar extravehicular activity (EVA-1) at the Hadley-Apennine landing site on July 31, 1971. A portion of the Lunar Module (LM) "Falcon" is on the left. The undeployed Laser Ranging Retro-Reflector (LR-3) lies atop the LM's Modular Equipment Stowage Assembly (MESA). This view is looking slightly West of South. Hadley Delta and the Apennine Front are in the background to the left. St. George crater is approximately 5 kilometers (about 3 statute miles) in the distance behind Irwin's head.